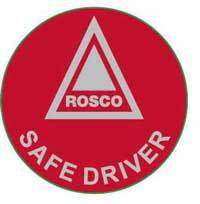 NEW THIS YEAR, the ROSCO ‘safe driver’ badge is designed for drivers to show that they are a registered ROSCO Safe Driver. Replacing the tie pin that was offered for many years, this badge has a modern style clasp fitting and is finished with silver lettering on a red background. The badge shows no years so can be used as you wish. Cost of the badge is just 60p each ( plus VAT) minimum order 30 badges. Just email us at admin@rosco-uk.org to place an order.